Source: Review copy from the publisher through BookLook. In a culture that applauds what can be produced and noticed, it’s hard to spend time hidden from others—the long afternoons with a toddler, the fourth-floor cubicle, the laundry room. Aren’t those wasted hours? Wasted gifts? 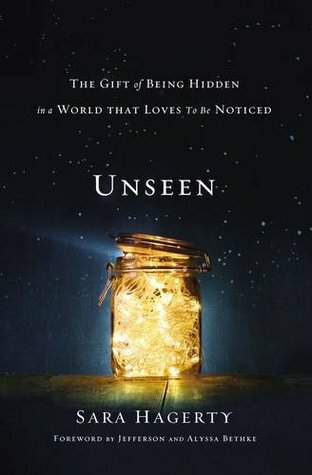 In Unseen, Sara Hagerty suggests that God created every heart to be seen—and it’s the unseen moments that draw hearts closest to the One who sees them best. Through an eloquent exploration of both personal and biblical story, Hagerty calls readers to offer every unseen, “wasted” minute to God so that they might find new intimacy with Him. She looks in particular at the story of Mary, who wasted perfume at Jesus’s feet. Mary had such love for Jesus that she was able to pour herself out for Him, though no one applauded. In doing so, with nothing tangible to show for her actions, she changed the world. Unseen is part memoir and part Bible study. Her intent is to help draw people into a closer relationship with God. The author looked at how Mary lavishly "wasted" her time (and perfume) on Jesus and was praised for it. Using Mary's story as a jumping off point, she talked about things that happened in her life that illustrated a certain point or that showed how mundane moments drew her closer to God. As a young adult, she felt that any minute not spent serving God was "wasted," so the overall theme was how God taught her that the ordinary, unseen moments of life also please Him. She talked about how we can deepen our relationship with God and see His greatness in the everyday moments of life, like doing laundry. The author (and her husband) adopted orphans from several foreign countries, so she explained how raising them has given her insights into how we're like these adopted orphans in our relationship with God. Overall, I'd highly recommend this book.